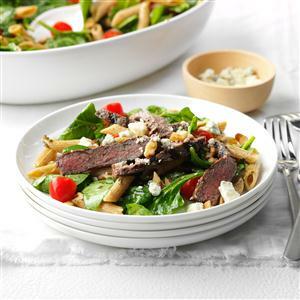 I make this salad with leftover steak. Slice the leftover steak and let it come to room temperature while fixing the salad. I am gluten free, so I use gluten-free penne pasta. Meanwhile, sprinkle steaks with salt and pepper. Grill steaks, covered, over medium heat or broil 4 in. from heat 5-7 minutes on each side or until meat reaches desired doneness (for medium-rare, a thermometer should read 145°; medium, 160°; well-done, 170°). Drain pasta; transfer to a large bowl. Add spinach, tomatoes, pesto and walnuts; toss to coat. Cut steak into thin slices. Serve pasta mixture with beef; sprinkle with cheese. Yield: 4 servings.